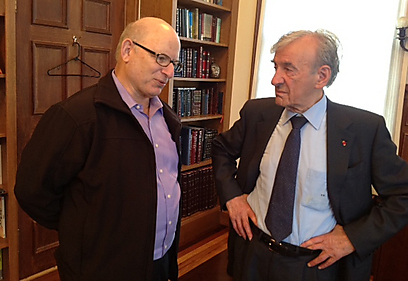 Elie Wiesel, right, in his office at Boston University with his Israeli editor and archivist, Joel Rappel, who announced the discovery of a Hebrew version of “Night” in an exclusive report to Haaretz. The controversy about the origins of “Night” is given more fuel by the recent announcement of Dr. Joel Rappel that he found a 150-page, handwritten document in Hebrew in the unsorted mass of Elie Wiesel’s personal papers. I wrote about Yoel Rappel’s relationship with Elie Wiesel two years ago. Wiesel selected this Israeli journalist, editor and media expert he has known for decades to have control over how his writings and life story will be presented to the public – meaning what will be presented and what withheld. While Boston University is going to house the Wiesel Archive, it is not in control of it. Wiesel brought Dr. Rappel to Boston, put him on the payroll as “visiting scholar”, then put him in in charge of the Wiesel archive project. Which one have you read? They are all different, except for numbers 3 and 4 which are identical in content; thus it’s actually more accurate to say there are five versions, but I’m sticking with six. This latest discovery (#6) seems closest to number two in content, and, in fact, the content is not new if you are familiar with the non-fictional books Wiesel has published over the years, in which all these ideas have been expressed. The Haaretz report written by Ofer Aderet contains the following quotes from the “Hebrew Night”, probably given to him by Rappel. These are passages you won’t find in your conventional Night (#3,4 and 5). This is so disingenuous because Wiesel writes on many occasions that warnings were received but not believed, even by his own father (who was an optimist) because the Jews didn’t want to take action that would discomfort themselves. His own family, he has written, refused help from Christians who wanted to hide them. They did know about the deportations, but they hoped it would pass them by or the Russians would get there first. This is a different Wiesel than the author of La Nuit, which was more the product of Francois Mauriac and the publisher Jerome Lindon. La Nuit was written for the goyim, the Christian West, but it doesn’t say everything Wiesel had originally said to his fellow Jews. Later, he put much of it in other books, essays and interviews, and now it’s coming to us in this “new, expanded version of Night.” Why now? Well, Wiesel will be 88-years old on September 30th and is apparently not in the best of health, so people like Dr. Rappel are getting his legacy in order. If that’s true, why did Wiesel store it away, deep in his mass of papers? “He knew that, someday, someone would find this manuscript and leave it for the following generations,” believes Rappel. This last sentence gives away the nonsensical nature of this whole “discovery” of a lost manuscript. If Wiesel wanted survivors to read it, he wouldn’t at the same time hide it from them, allowing only future generations to read it. Seems to me he decided not to compete with his already published version, maybe at the request of his French publisher. At the time he was supposedly writing it – the late 50’s – the English language Night had not yet been published. But Wiesel is perhaps not satisfied with what is left of his “epic” in La Nuit and begins preparing a Hebrew version that reinstates some of his original. What is described here by Rappel as a “hugely different” version of Night is very similar, in fact, to the 245-page Yiddish Un di velt hot geshvign (And the world remained silent) which Wiesel says he wrote in April 1954 on a ship heading for Brazil. [All Rivers Run to the Sea: Memoirs (New York, 1995), pp. 239-40] It appears he was mining that book – returning to what he originally wrote and was published by Mark Turkov as part of the 176-volume Polish Jewry Memoirs Series [Dos poylishe yidntum]. Have you destroyed the original nine hundred pages of Night? Of course, if Wiesel had one at home, they wouldn’t need to send it back to him. Except … on page 241 he had also written: “It was my only copy, but Turkov assured me it would be safe with him.” So which is right? Rappel quotes from Wiesel’s memoir several times, thus I believe he would think it necessary to go with the memoir over the interview. However, it’s a major contradiction and I wonder if he would be willing to attempt an answer to it. So right now the burning question is: Will Dr. Joel Rappel find the original typewritten 862-page manuscript in Elie Wiesel’s 330 boxes of material, as he found the 150-page handwritten Hebrew Night? It should be there since Wiesel told Friedman he kept it. Or did he destroy it between 1978 and 1995 because he no longer believed it should be kept? Or is Rappel keeping it hidden for reasons of his own, perhaps because of the many contradictions that undermine the integrity of Wiesel’s memoir? The only thing we know for certain is that we’re dealing with dishonest people so we can’t expect we’ll ever really know. Most ‘holocaust survivors’ wait for all witnesses to die before they tell their story and Wiesel is no exception. This is my first question, but there are others, such as: since Un di velt hot geshvign is a published book, those who know Yiddish can easily read it, why therefore does Rappel ignore it? I have included portions of it translated to French and English here at Elie Wiesel Cons The World. Naomi Siedman, a professor of Jewish studies, has written a well-known article quoting from it, as have others. Yet Rappel speaks of these passages as if they were previously unknown. Well, to the general public, they are. True enough, but is Rappel not familiar with the Yiddish book that Wiesel claims to have written or does he want to discourage attention to it? Siedman also noted significant differences in the ways each book reveals Wiesel’s writing process: In the Yiddish memoir (#2), he starts to write immediately after liberation, while the French text (#3) says he started writing only after a 10-year vow of silence. I have discussed Siedman’s commentary here. An article in the Jewish Journal from 2013 gives an interesting insight into Wiesel’s insistence that his book Night is in no way fiction. In that same article, Gary Weissman, an assistant professor of English at the University of Cincinnati, said he finds Wiesel’s celebrity a distraction. How very true. And it’s guaranteed to get worse, what with his ever-advancing age. I don’t have a clue what could put the genie back in the bottle when it comes to the over-inflated reputation of this man, other than taking the media out of the hands of Jewish monopolies. 6 Comments to Wiesel archivist finds another version of “Night” – now there are six! Do you think Rappel&apos;s allowed to see that tattoo? The question might be better asked: Does Rappel know Wiesel doesn’t have a tattoo? I suppose he doesn’t care one bit. Why did Wiesel decide to leave Auschwitz with the SS rather than remain behind to be liberated by the Red Horde? He claims he was given this choice by the camp guards. Mannstein – My position is that Wiesel was not in Auschwitz or Buchenwald; therefore his STORY about deciding to leave Auschwitz with the SS guards comes from other stories and histories he had read. My position is that the book Night is fiction. I have written about this in several articles on this site, and I have questioned Wiesel&apos;s "facts" and his past before 1950 in just about all of them. Are you aware that in Night Wiesel was operated on his foot at this point in the story, but in his "autobiography All Rivers Run to the Sea (1995), he describes the same operation as on his knee! He has never remarked on this because not a single journalist or holocaust historian has questioned him about it!! That&apos;s the situation with Wiesel, and why he&apos;s not at all worried about his lies. I wasn&apos;t aware that he claimed it was his foot that was operated on and then later it was his knee. A lot of things don&apos;t make sense with his story. For instance anyone that was sick or unable to work was dispatched to the gas according to the survivors yet Wiesel was treated in the camp hospital. Why would there be a hospital in a death camp? Incidentally the Germans just prosecuted an Auschwitz medic. What&apos;s a medic doing in a death camp? Certainly not taking care of the SS. They could get treated in the larger cities like Katowitz which is close by. It has often been stated that if the Germans intended to kill the people within the camps then all they needed to do was nothing – not give them water, food, shelter or disinfect their clothing. As I understand, it cost Germany colossal sums of money to keep them alive. Himmler, a catholic, wrote a letter to the head of the camp system, Pohl, requiring him to do all he could to keep the inmates alive. The Pope visited Auschwitz but remained silent. Perhaps he knows that (according to the cremation registers, most of those who died there (typhus, old age, starvation at the end of the war) were catholics. About 150,000 inmates chose to follow the German guards back into Germany when Auschwitz was abandoned. They knew that at least the Germans had provided them with their necessities (and wages). Naturally, this voluntary march has since been described as a ‘death march’ because inmates died on the march.